The diagnosis of cancer, be it breast or thyroid, often requires the services of three physicians trained in the medical specialties of surgery, radiology and pathology. Each specialist provides a unique viewpoint and skills to the patient as they collaborate to diagnose a potential cancer. Important tools used to diagnose cancer are the fine needle aspiration biopsy, the core needle biopsy and the open biopsy. Fine needle aspiration (FNA) is the use of a very thin, fine needle to remove tissue or cells from the lesion through displacement or suction. An FNA is the least invasive of the various diagnostic procedures. It can be performed in a doctor’s office, with or without ultrasound guidance, and little downtime is required. It is also the least expensive of the three methods. In the hands of a fine needle aspiration specialist, this procedure is quick, safe and accurate. Results are typically available within a day or so. A core needle biopsy (CNB) requires a much larger needle and special imaging technology (ultrasound or x-ray) is required to find the potentially cancerous tissue. CNB is more likely to be performed by a radiologist, with the tissue examination completed by a pathologist. A CNB is performed in an outpatient or hospital radiology center and can be technically challenging. Local anesthetic and occasionally sedatives are required. The results are usually available in a few days to a week. A third way to obtain a specimen is with an open biopsy (an incision or cut into the tissue), often performed by a surgeon. It is then sent to the laboratory, where a pathologist makes a diagnosis, usually available in a few days to a few weeks. In the discussion of FNA vs. CNB, opinions abound as to which is the preferred test. Usually when diagnosing breast cancer, CNB is preferred, however, FNA can be deployed. In contrast, for thyroid nodules, FNA is the test of choice (and there is no place for CNB). Dr. Nadelman has the unique perspective of a fine needle aspiration specialist and a cytopathologist. The best choice for an individual patient depends on factors such as the location of the lesion, the patient’s overall health and the doctor’s skill and experience. In some cases, an FNA followed by a CNB is the best choice. 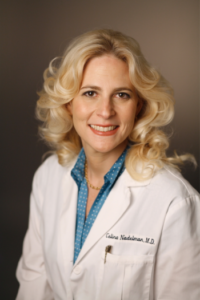 As a board-certified cytopathologist, Dr. Nadelman can help you make that decision.